Belfast, UK. 17 May, 2018. 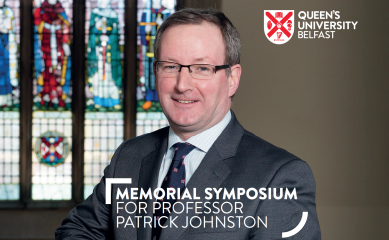 Robert Ladner, CEO and Founder of CV6 Therapeutics Ltd (CV6), paid tribute today to Professor Patrick G. Johnston at a memorial symposium hosted by Queen’s University Belfast to honour and celebrate the life and accomplishments of “A Leader and Innovator in Cancer Research and Treatment”. Patrick, or ‘Paddy’ to those who knew him, passed suddenly in June 2017 while serving as Queen’s University Belfast President and Vice-Chancellor. Paddy was a pioneer in the cancer research field, a truly inspirational and visionary leader of international recognition who inspired those around him to ‘dream no little dreams’. Throughout his distinguished career, Paddy was renowned for his personal integrity and his clear vision and strategic direction as he pursued excellence across a broad range of challenging endeavours. Paddy was undoubtedly one of the most outstanding contributors to cancer research of his generation. Robert gave a presentation entitled “Thymidylate Metabolism and Synthetic Lethality: A Target Hidden in Plain Sight”, a presentation that commemorated the research field that Paddy pioneered throughout his career but also highlighted the new and exciting developments he was involved with in this field as Chairman of the Board of Directors of CV6 Therapeutics. Robert presented exciting new data surrounding CV6-168, a novel and selective dUTPase inhibitor developed by CV6 Therapeutics that is designed to significantly increase the efficacy of TS-targeted therapies and is poised to enter clinical trials in 2019. Paddy was a close friend and mentor to several members of the CV6 team for many years. Paddy shared our vision for transforming cancer treatment on a global scale. He is deeply missed by all of us at CV6 Therapeutics. CV6 Therapeutics is a drug development company focused on the discovery, development and commercialization of novel therapies for the treatment of human diseases. To learn more about CV6 Therapeutics and its product pipeline including CV6-168, click here: CV6 Therapeutics. © 2019 CV6 Therapeutics (NI) Ltd. All rights reserved.